For years iOS has been criticized for not allowing user to use different keyboards, but that's about to change with the arrival of the new iOS8. And we already have a keyboard that is hoping to save you a lot of typing as soon as it arrives: QuickBoard. 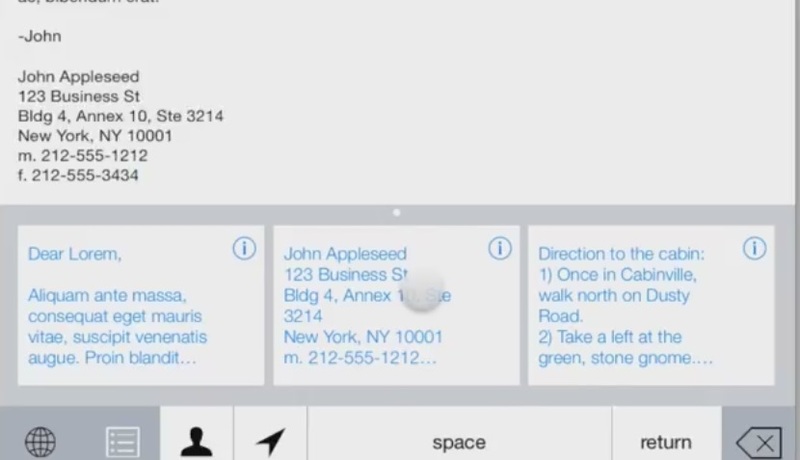 If you're tired of constantly typing your name, address, email, then you'll love QuickBoard. This keyboard mixes a regular keyboard with preset "clipbpoard" sections where you can have different kinds of data already typed and ready to insert with a single touch. Some of you may already be using the custom "auto-correction" entries for identical purposes (making "eml" expand to your email - for instance) but this is a lot simpler and manageable to do. ... Really can't imagine how no one has ever thought of this before (a friend tells me there was something similar back in the "Windows Mobile" days, but that he was surprised not to find anything like it for Android).